So many store bought granolas are full of added sugar and/or oils. 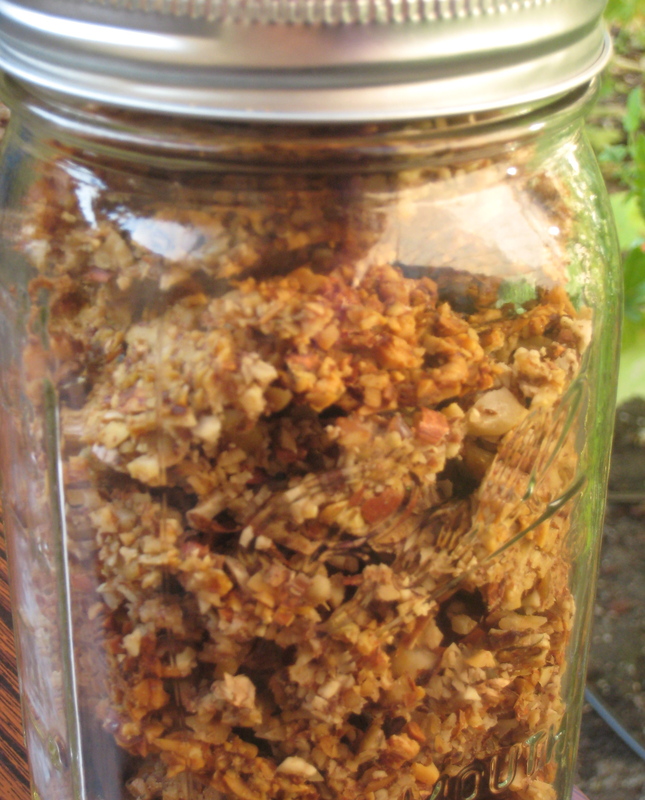 Making your own granola is so easy, fun and totally customizable. My daughter and husband were very interested in the process (although my husband may have been just making conversation). In any event, it is very healthy and great to make with kids. These instructions are based on a recipe from Elana’s Pantry a wonderful gluten-free blog I have been reading for years. If you are looking for some new ideas go check out her blog! Put fruit, seeds and nuts into large bowl. Add flavor extract, salt, and spices and stir to combine. Lay mixture on two baking sheets lined with parchment paper. Bake in oven at 225 for @ 40 minutes. Turn oven off and leave in overnight so it dries completely. Break up and store in glass jar. Looks yummy! what would I be presoaking my nuts in, if I chose to do so? (remembr I’m a total n00b to healthy cooking….